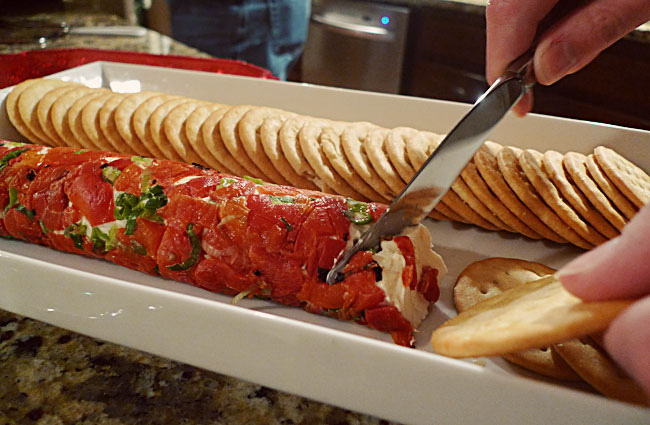 Here's a little appetizer I threw together for the Christmas party. It's really simple, looks festive, and is soooo good. In a bowl, beat softened cream cheese with garlic salt. Chill for 20 minutes or until firm enough to handle. Meanwhile, prepare the peppers by dicing and making sure all the liquid has been removed. Squeeze gently with a paper towel, set aside. Thinly slice the green portion of a green onion. Once the cream cheese is chilled and firm, scoop it onto a piece of plastic wrap into a tube formation. Wrap the plastic wrap around it, then roll and mold into an 8 inch log. On another piece of plastic wrap, sprinkle the diced pepper and green onion in a rectangular shape, about 8" x 4". 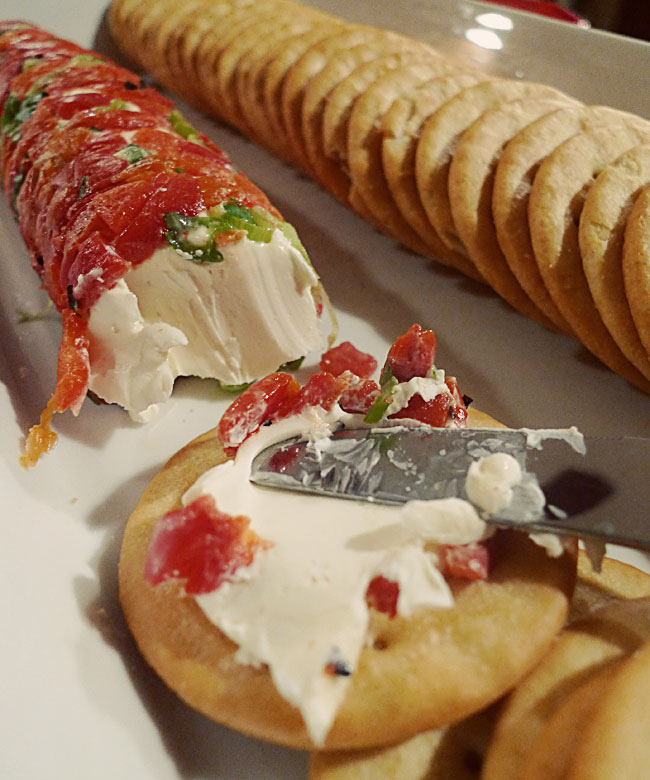 Gently unmold the cream cheese log onto the peppers and onion, and roll back and forth, coating all the sides. (If the cream cheese is too soft to handle, it can be chilled once more before rolling in the peppers and onion.) Wrap the plastic wrap around the coated log, and roll back and forth again to make sure the cream cheese log is uniformly shaped. Store refridgerated in an airtight conatiner until ready to serve. Serve with crackers.